Put the carving knife away, and bust out the jet. 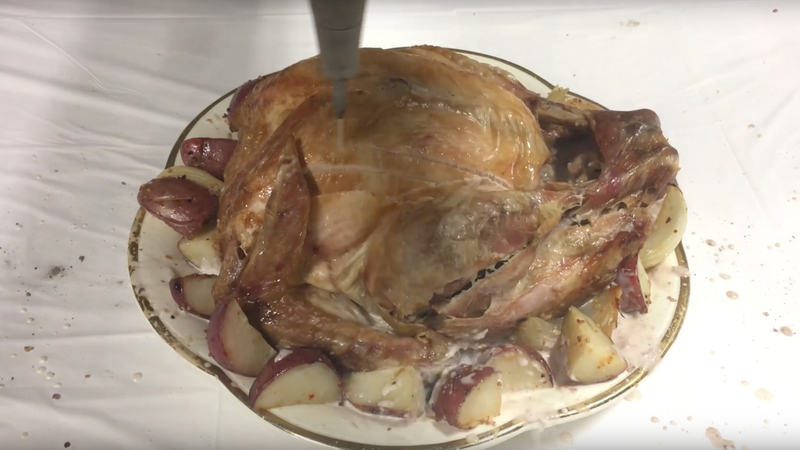 Carving the Turkey at Christmas is just about the manliest thing you can ever do, but sometimes festive traditions need a bit of an update, right? Sure, you can use a boring old carving knife to dish up the roast this year, but why not try something completely new? The guys at the Waterjet Channel have come up with an ingenious new way of carving using a high-pressure water spray. The jet cuts through the bird, and leaves it surprisingly well sliced. Sure, it’s a bit messy, and it leaves your meal looking a little soggy, but it’s definitely more fun than using a knife. Fancy doing this yourself? The industrial waterjet used in the video costs a hundred thousand dollars, so probably better to stick to the carving knife for now. Still, this looks way cooler.